Categories: Sold Items, Sold Rolex Watches. The Rolex Submariner is such an iconic model by Rolex, and here we have a great transitional 18ct gold and steel Rolex Submariner reference 16803. Referred to as a “transitional” model, this is due that the fact that the previous model, the Rolex 1680 was fitted with an acrylic crystal and rated to a depth of 200m. Then Rolex produced this Rolex Submariner 16803 which was fitted with the sapphire crystal which also allowed its depth rating to be increased to 300m. 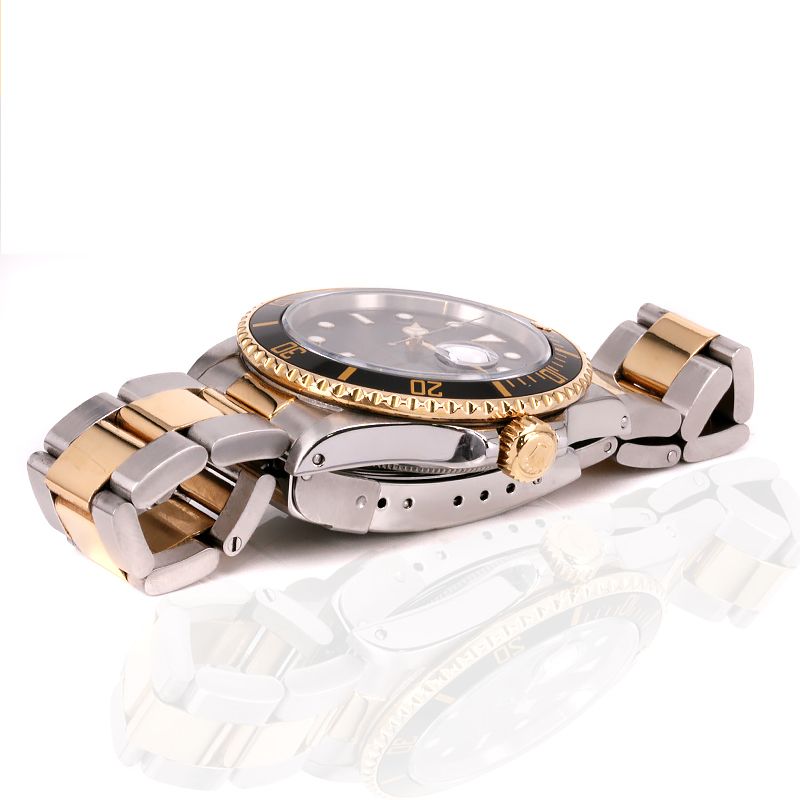 This was also the first model made in 18ct gold and stainless steel. This model was only produced for 4 years until Rolex introduced the Rolex Submariner 16613 making this quite a rare model to find. Still made in the iconic 40mm case plus the Rolex screw down crown, it is fitted on the Rolex Oyster band which is in great condition. Inside there is the 27 jewelled automatic Rolex calibre 3035 that has just come back from a full service and comes with our twelve month warranty. With the black dial and bezel looking amazing set against the steel and gold, this Rolex Submariner 16803 is collectable as it is handsome and rugged. Gents 18ct gold and steel Rolex Submariner reference 16803. The Rolex Submariner has been one of if not Rolex’s most iconic and sought after model for over 50 years and remains as popular today as it did over half a century ago. With subtle changes from higher beat movements, to sapphire crystal replacing acrylic crystal, flat index markers becoming raised, and the bezel now in ceramic, the entire look and style has rightfully remained unchanged and has no intention going out of style or popularity anytime soon. Inside it has the Rolex 27 jewelled automatic calibre 3035. This Rolex Submariner 16803 has the “Swiss T<25” dial. Tritium is radioluminescent and has a half life of about 15 years. Since this material was phased out in the 1990’s , it has become more sought after by collectors. If you don’t see a T near the Swiss at the very bottom of the dial, it is not a tritium dial. Tritium develops a nice patina with age and is often what watch collectors go for. When looking at the patina of the dial, make sure the hands have achieved a similar patina and match accordingly. The Rolex Submariner 16803 was launched in 1984 and was only produced until 1988. This transitional Rolex model is special because it is one of the models that introduced the sapphire crystal to Rolex watches. 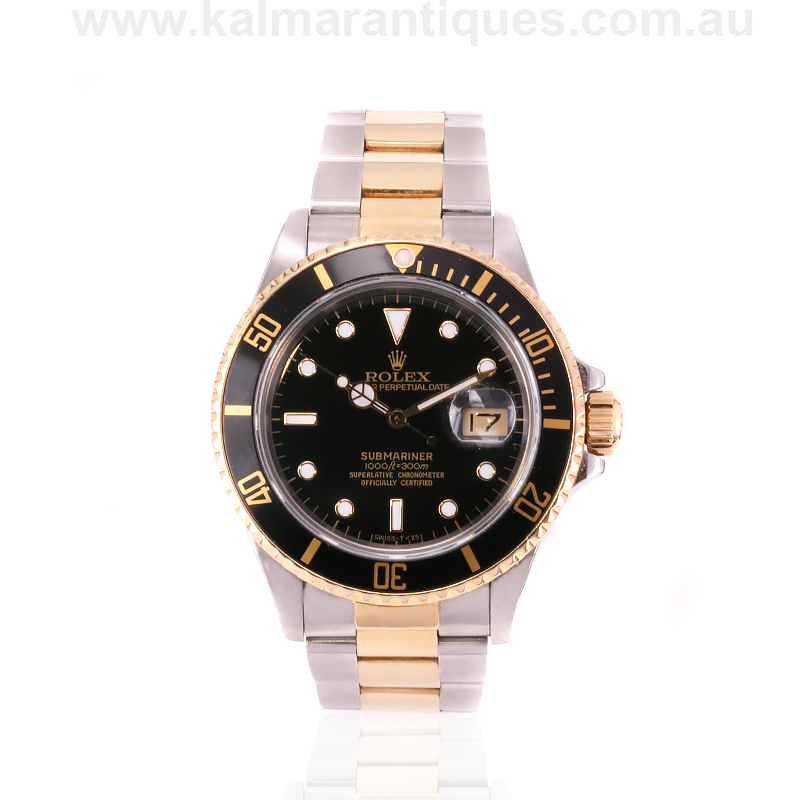 The 16803 was also the first gold and steel Rolex Submariner model. As with all Rolex Submariners, the 16803 off course is water resistant. With the additional of the sapphire crystal, this allowed an increase of 100 meters to the old Submariner’s water resistance rate of 200 meters. The Rolex Submariner 16803 was now increased to a water resistance rating of 300 meters. In perfect condition and fully serviced, this gold and steel black dial Rolex Submariner is just perfect.